Home » About Us » Blog » 2019 Marabana: Go For It! Its 5 o'clock in the morning, I wake up excited. Today is the big day. Today, I push my body and transcend the doubts and jitters of my mind to run the Marabana - Havana’s annual marathon. I do my routine without changing a thing; it always brings me luck. I continue to prepare myself and there is only one thought on my mind, I’m already a winner, I’m in Havana! Six months ago, I decided to test myself. After perusing the internet and social media, one particular destination repeatedly popped up on my timeline – Cuba. The crystal waters, classic cars, mouthwatering mojitos. The images all seemed to take on a life of their own. I have always wanted to know the island. For so long, it has been off limits for Americans like me, but alas, that’s all changing with the help of tour groups like insightCuba. 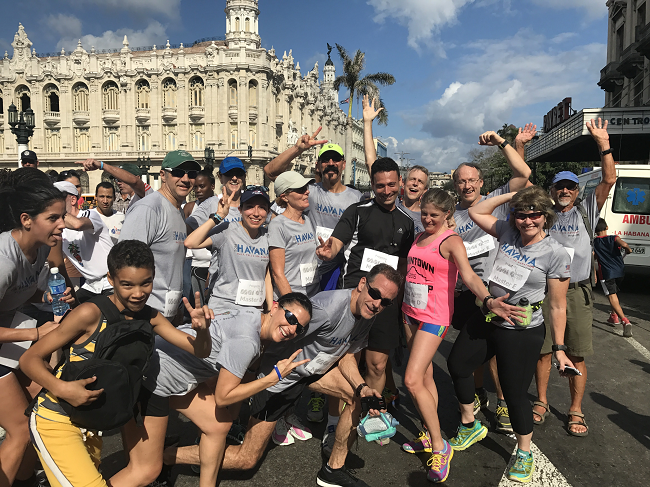 What better way to explore Cuba than running the streets of her capital city? With 4 day packages priced under $1,500, it was one of the easiest decisions I've had to make. 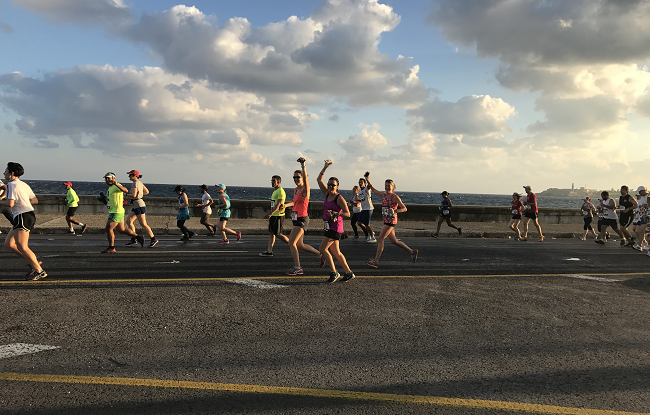 More than 1,000 foreign runners got up November 18, 2018, at 7:00am and started an epic journey facing fatigue, heat and pain. This year, November 10, 2019, the same amount or more runners will face their fears while adrenaline pumps blood and perseverance to all corners of their bodies. Some, will choose to run the 10k race, others, more intrepid and experienced, the half or full marathon. All three are options when registering. Most celebrations commence after completing a marathon, but when racing the Marabana the party starts before the race. 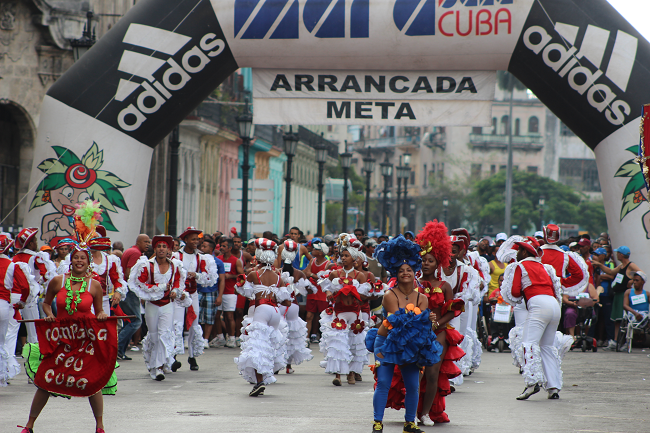 Runners can enjoy music and aerobics to help you warm-up in true Cuban fashion. A little-known fact: the start of the marathon doesn’t begin with a typical shot, but with the ring of a bell in honor of the Bell of La Demajagua. Carlos Manuel de Cespedes, the "Father of the Nation", used the bell of La Demajagua as a rally cry to gather his slaves to join in the fight for Cuba’s independence against Spain in 1868. Participants of all ages line up, the bell rings, and over 5,000 people take to the Malecón, Havana’s picturesque seaside boulevard. Here you’re rewarded with the sun gently rising over the Caribbean Sea and bursts of island morning breeze. In a few miles, you’ll approach the corner of 23 and 12, the heart of Havana, then pass by sports city, until you reach Plaza de la Revolución and race down Reina street. In the blink of an eye you will travel back in time. Taking in 500 year old architecture, rich culture and traditions as you approach the final 21km marker. Keep in mind that the full marathon is two laps - but don’t be discouraged. The second lap allows you to see in detail what you missed the first go-round. For those that prefer a slower pace, there’s nothing to worry about. The marathon lasts for six hours with no pressure to make time. Marabana starting line with music and dancers. If you are up for the challenge, you can also run the popular 3km race the day before. There’s no need to sign up again. Just enjoy the warm welcome that not only awaits you at the finish line but in the streets of Havana. This event is popular with kids and adults alike. 1. Stay hydrated, the temperature rises quickly on the island. 2. Filtered water stations are provided but if you prefer fruit or energy drinks you should think about bringing your own. 3. Use the showers at the end of the boardwalk. It helps to remove the salt from your skin and prevent sunburn in the Caribbean sun. 4. Avoid chafing. There will be sweat, and lots of it. So wear comfortable clothes and shoes that you have previously tested and feel comfortable in. 5. Take note of the course beforehand. Although you will find volunteers throughout the course that will guide and keep you safe from traffic, it is always good to have a reference of where you are located. The Marabana is one marathon that is sure to keep you engaged. You’ll have a chance to take in all of Havana’s charm, that’s sure to bewitch you, as she does all her visitors. If you are on the fence about the race, I can only tell you to GO FOR IT! You won’t regret or forget it.